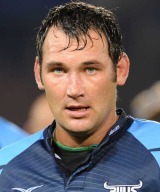 A versatile back-row forward, who is also able to deputise in the second-row, Wannenburg made his debut for the Blue Bulls against the Golden Lions in 2001, stepping up to Super 12 level in 2002. Wannenburg's introduction to Super Rugby immediately brought him to the attention of the national selectors, and he made his Test bow in a defeat to France at the Stade Velodrome that November. A former South Africa Schools international and U21 representative, Wannenburg never nailed down a starting spot for the Springboks but was nevertheless a regular squad member until 2007. In the colours of the Bulls, Wannenburg has won two Super 14 titles, starting the 2007 final at blindside. In 2009 Wannenburg admitted in a magazine interview that he had experimented with cocaine and ecstasy while also drinking heavily. The Bulls confirmed, though, that he had never failed a drugs test. In 2010 he joined Ulster and quickly became a key figure for the Irish province.